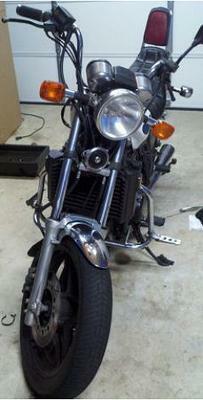 The 1983 HONDA V45 Magna for sale runs well but I want a newer motorcycle. I have put a lot of time and invested a lot off money into bringing her up to speed and restoring her but now I'm done and I want to do something else. there is a list below of the items that have been added and replaced. This year v45 is a hard to find and highly sought after since it has the 4 stroke V engine, a rare type of carb setup and this one has only 10,900 miles which is not bad for a bike of this age. The NADA motorcycle blue book places the value of C. 1983 Honda magna V45 at $2000. If you have an opinion on this motorcycle or know of any problems that are associated with it and would like to write a review, you are welcome to do so using the space below that has been provided by Strike Lightning Used Motorcycles for Sale (and PLEASE do not neglect to include your contact information in your email or to provide a phone number or email address!) so that I can respond with answers to your questions or after consideration of your best offer as quickly as possible. In my opinion there is not a better looking Honda magna for sale in the Washington DC or Woodbridge Virginia VA area, on Craigslist or in an Ebay auction than mine so hurry and make an offer before this beauty gets away from you! Strike Lightning would also encourage bikers to submit a review of the 1983 HONDA V45 Magna to make the biker community aware of any problems that are commonly associated with the 1983 model or to highlight its positive features and help potential buyers make informed decisions. I will accept $1300 for the bike or you are welcome to submit a best offer bid when you call or text me at 703 357-3774 and don't forget to mention that you found this ad on Strike Lightning's Motorcycle Classifieds gogocycles.com.